Create a rustic dining room with this 9 Piece Table & Chair Set. The rectangular extension table features a beautiful burnished brown wood top with elegant turned legs. One 18 inch table leaf is featured to extend the table from 70 to 88 inches. It can seat 6 to 8 people comfortably. Six double X back chairs and two double X back arm chairs complement the table with matching turned legs and a burnished brown finish. The Porter 9 Piece Rectangular Extension Table & Chair Set by Ashley Furniture at AHFA in the area. Product availability may vary. Contact us for the most current availability on this product. 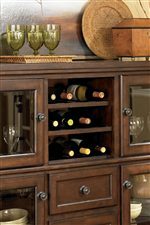 Handles & Hardware Drawers and doors feature a dark bronze colored knob and back plate. Case Detail Turned legs. Double X back. Bun feet. Chamfered edges. Welcome the Porter Collection to your home to bring a rustic and traditional feel. 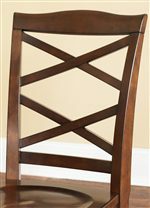 This collection features dining and bedroom pieces that are made with select cherry veneer and hardwood solids in a burnished brown finish. 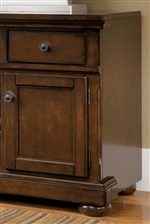 Drawers feature a dark bronze colored knob and back plate with dovetail construction, ball bearing drawer glides and felt or cedar lined drawer bottoms. Turned legs, bun feet, paneled drawers and double X designs are featured throughout this collection. Transform your home into a warm, inviting and comfortable haven for you and your family to enjoy with the Porter Collection. 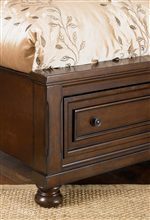 The Porter collection is a great option if you are looking for Traditional furniture in the area. Browse other items in the Porter collection from AHFA in the area.